Shanghai is the largest city in China and among the most populous in the world. Shanghai “above the sea” or Shàng Hǎi in Chinese, is a rich mix of tradition and modern with non-stop energy and surprise. Port city on the Huangxiepu River, where the Yangtze River empties into the East China Sea, the city encompasses an area of 7,037 square km (2,717 square miles) and a resident population of over 23 million in 2017. So many areas to explore, but the former French Concession, a foreign concession from 1849 to 1946 is a highlight with its treelined streets. The Bund presents art deco and as early 20th century architecture. In contrast and just across the Huangxiepu, among the tallest tallest and most modern buildings in the world are on view. Shanghai Tower, Shanghai World Financial Center, Oriental Pearl Tower and Jin Mao Tower are highlights. Renovated residential area in French Concession turned into a labyrinth of shops and cafes. Super charming and great for your shopping and chilling needs. The Bund (embankment or embanked quay) refers to the waterfront area in Central Shanghai, “outer beach” centered on Zhongshan Road, within the former Shanghai International Settlement. The area across from the Huangpu River contains modern supertall skycrpaers of Lujiazui Pudong District and serves as a dramatic view day or night. Building heights are restricted on The Bund to maintain the scale and character of this most famous area. Eclectic architecture on The Bund includes Romanesque Revival, Gothic Revival, Renaissance Revival, Baroque Revival, Beaux-Arts and Art Deco. Although a spectacular view from The Bund day or night, visitors should be sure to walk around and visit the interiors of the three supertell skyscrapers in Shanghai. Three three towers form the world’s first adjacent grouping of three supertall skyscrapers. The Shanghai Tower, at 2,073 feet, is 128 stories and the tallest building in the world as of 2015, by usable floor (127). It also has the world’s fastest elevators and world’ highest observation deck.It is the world’s second tallest builidng by height to architectural top. The building was designed by Gensler and is owned by Shanghai city government. 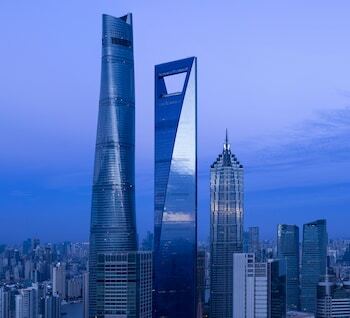 The Shanghai World Financial Center was designed by Kohn Pederson Fox, is 1,614 feet tall and was topped off in 2007. Jin Mao Tower is 1,380 feet tall and was designed by the Chicago firm Skidmore Owings & Merrill. In postmodern form, it draws on traditional Chinese architecture. Official opening date was in 1998. The Oriental Pearl Radio and TV Tower was completed in 1994 with chief designers Jiang Huan Chen, Lin Benlin, and Zhang Xiulin. The tower features eleven spheres big and small. Popular Japanese style speakeasy hidden behind a door in a bartending supply shop. Impeccably prepared and presented cocktails. Four floors; as you ascend prices go up and the mood gets quieter. If you are lucky enough to score a set don’t leave. This place radiates class and attention to detail. Impeccably designed and serving most perfect coffee. Difficult to find but once you do, you will not want to depart. Largest and most opulent indoor shopping experience in Shanghai. There is no end the the food in Shanghai and a large concentration of it happens to be located inside malls. Shanghai’s largest mall contains a dizzying amount of food, restaurants, cafes and snack options. Step inside and you will find anything you need to eat. Perfect civility above the bustle of the M50 art world. Small, intimate and fresh with tremendous attention to detail. Light French fare, pastries and coffees. Peninsula style in a most idilic location on The Bund. 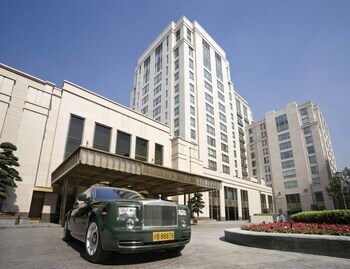 Impeccable style and surroundings; visit the various restaurants and lounges and be ready for Shanghai perfection. Spectacular rooftop views. Opened in 1934, The Park Hotel was the tallest building in Asia until 1958. Designed by the Hungarian-Slovakian architect Laslo Hundec, the builing was inspired by the American Radiator Building in NYC. Truly an art deco masterpiece. The former Shanghai Club is a Baroque revival masterpiece on The Bund. Repurposed and restored as Waldorf=Astoria, a modern tower has been added to complete the project. Be sure to enter from The Bund and glance at the vintage elevator cabs still run by operators. Restored to 1910, The Long Bar is about beautiful stained glass, wood, heritage and flawless cocktails. Not to be missed, whether you are spending the night upstairs or not. Locations in the French Concession and The Bund, enjoy the food and design of the minority tribes of Yunnan. Large and bustling dining rooms serving approachable, unusual flavors combined for unforgettable tastes. 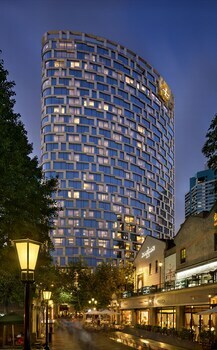 Striking contemporary tower overlooking boutique filled Huai Hai Road. Across from pedestrian friendly Xintiandi full of “of the moment” shops, cafes and music. From the moment you enter, your senses will be aroused by scents, flora and crisp design. Multi-level shopping labyrinth containing over 150 shops, vendors and stalls selling Chinese tea and everything related. Let yourself go and explore the traditions and magical world of Chinese tea. Every form and flavor; ddon’t be afraid to enter any selling area and ask for a sip. Large landscaped park in the west of Shanghai. Adjacent to East China Normal University, the park features Yin Chu Lake, Ocean Life, areas to exercise, stroll, run, contemplate and boat. One of the earliest creative clusters in Shanghai, the former Xinhe Cotton Mill has been tranformed into a progressive oasis of galleries and workspaces. The creative park along Suzhou Creek contains beautifully preserved former industrial buildings. Situated amidst the futuristic Lujiazui business district of Pudong lies Park Hyatt, a modern Chinese residence that is among the highest hotels in the world. Occupying floors 79 through 93 of Shanghai World Financial Center, a mixed use development with a distinctive trapezoid aperture at the peak. The Living Room lounge is not to be missed. Even if you are not a hotel guest, experience Water’s Edge Spa with an infinity pool, sauna complete with picture window and hot tub, and a plethora of other amenities to provide an unforgettably relaxing and serene experience.